This is the first-hand account of Rudolf's Vrba's extraordinary experiences as a registrar at Auschwitz as well as the story of his daring escape. Although a testimonial full of unbearable, vivid horror and suffering, it isn't this that makes the book so gripping, and so important. What endures is Vrba's personality, his unbelievable physical tenacity, and, incredibly enough, his sense of humour. 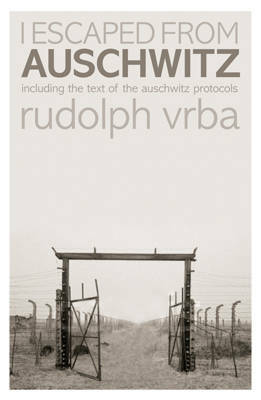 Vrba was imprisoned in Auschwitz for twenty-one months and seven days. He then escaped with his fellow Slovak Alfred Weltzler. As they made their way home, they carried with them, seared in their immediate memory, the true story of the camp, the hitherto 'unknown destination' of Jewish deportees from all over Europe. Initially conceived as a serialisation in the 'Daily Herald' in 1960, this full account is being published for the first time in twenty years. It is a must read for any person interested in understanding not only the inner workings of the prison camp, with the expected horrors and brutality, but also a personal story of strength, survival and guile.